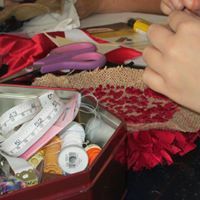 This day session will cover the techniques needed to make a small cushion or decorative item. We will be using loop and shaggy rug effect weaves using a American hook and traditional prodder, we will also look at how to select and prepare materials, work with hessian, tension your work, and how to finish it off. You will be provided with a prodder and materials as well as instructions and information about where to find further resources, American hooks will be available for you to use and can be purchased from me at the end of the session if you would like keep them. 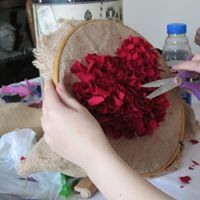 We will have time to make a small cushion/ art item if you have already had a go at making a rug rug item and want to attend as a refresher or to try something different you are welcome to join us and start creating a larger item to complete in your own time. The workshop are suitable for anyone unless otherwise stated please contact me if you have any questions please contact me. All tools and materials are included along with refreshments. I like to keep my attendee numbers low to enable me to provide the support and advice where as needed and limit my places to a maximum of 8 participants attending per day. Please also bring an apron or wear clothing that you like working in.